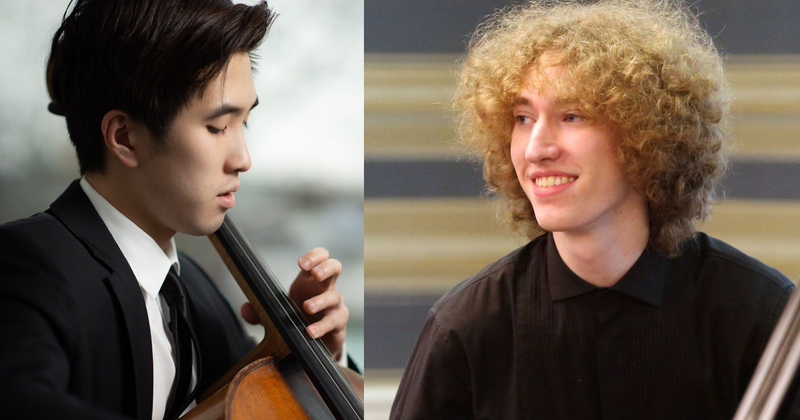 In advance of their upcoming recitals at the Curtis Institute of Music, cellist Chase Park and pianist Michael Davidman visit WRTI’s Performance Studio on Friday, April 19th at 12:10 PM to play Beethoven’s Sonata No. 4 in C major, and chat with WRTI’s Susan Lewis. This year, five cello/piano duos have worked on Beethoven’s five cello sonatas with acclaimed British cellist Colin Carr, who is completing a residency at Curtis. Listen to a preview of some of the music from these upcoming recitals when cellist Chase Park and pianist Michael Davidman visit WRTI’s Performance studio and talk with WRTI’s Susan Lewis. Michael Davidman, from New York City, began piano lessons at age five, and entered Curtis in 2015. He has been featured on WQXR (New York), WWFM, WHYY-TV’s On Stage at Curtis, and NPR’s From the Top. As a soloist, he’s performed with many ensembles, including the Philadelphia Orchestra, Symphonicity, the Monterey Symphony, and New York Chamber Players. He has appeared at music festivals and concert venues, including Alice Tully Hall at Lincoln Center, the Kimmel Center for the Performing Arts, Hahn Hall in Santa Barbara, Calif., and Bechstein Hall in London. His honors include first prize in the LISMA Foundation International Music Competition, the Ithaca College of Music Piano Competition, and the Wagner College Young Musicians Performance Competition. He also received a four-year scholarship from the Chopin Foundation of the United States. Chase Park, from Englewood Cliffs, N.J., began cello lessons at age 4, and later studied at the Juillard Pre-College Division. He entered Curtis in 2016. As a soloist, he has appeared at Weill Recital Hall and the Juilliard School; and with the Thurnauer Symphony Youth Orchestra and the New York Chamber Players. In 2009 he performed at Merkin Concert Hall as a guest artist with the Chamber Music Society of Lincoln Center. He’s won first prizes various competitions, including the New York Music Competition, the New York Chamber Players Annual Music Competition, and the JCC Thurnauer School of Music Concerto Competition.